First i want to thank you for making this great Emulator, i love it. puNES is running perfect on my Gaming PC but i have a problem running it on my second PC, a Retro Box (XP Pro, Dual Core @1,80, 2GB RAM, 512MB Nvidia ION). I've tested both latest versions 0.101 of D3D9 and SDL, both run fine when Audio is turned off but when i turn Audio on it starts to get micro stuttering. SDL runs better as it has very few micro stutter, D3D9 is unplayable and i get screen tearing (have DirectX9 installed). I've tried many things to fix this by enabling/disabling VSYNC in puNES, VSYNC in Nvidia Panel, disabling APU channels, downgrading Audio quality, CPU overclocking, nothing worked. It has probably something to do with XP being old or the Dual Core is to slow, however its just a Audio issue and it would be awesome if someone could help me out. I am asking this because the other Emulators such as ePSXe, PJ64, Snes9X run without any issue on my Retro Box and i am curious what i am missing for puNES. For future builds, it would be awesome if you could add a simple Game-List launcher similar to ePSXe's and a Scanline function with adjustable brightness similar to ePSXe's. edit: I found a solution, all i did was set the Mode to NTSC and Frameskip to 1, VSYNC is better to be turned off. It runs butter smooth now. Last edited by MagusLOGS on Thu Aug 03, 2017 6:20 am, edited 2 times in total. It might be the case but every body has his/her own experience! Last edited by martin123 on Thu May 04, 2017 10:46 pm, edited 1 time in total. i would like to try this beautiful emulator. where can i find the lates version for Windows 10 64 bit? Check the first post of the thread (since those links are kept up to date with the latest version), and pick one of the "win64 SDL" or "win64 D3D9" versions. ah thanks! which is the difference between "win64 SDL" or "win64 D3D9" versions ? If I want the SDL version i have to download and install SDL libraries, am I right? From here: https://www.libsdl.org/download-2.0.php I suppose i have to download the Rutime binaries for Windows 64 bit. Is it correct? Or the Source code? Hallo. I just found out about this particular NES emulator, which seems to be somewhat lesser known, currently. But my first impression, at least, is that it seems to be one of the best out there. Anyhow, I actually came here to give some feedback, too. It would make sense if you could go full-screen and keep the scale factor intact. Like, if I want full-screen on 1920x1080 with 4x scale for perfect scan-lines. I can't seem to do that currently, unless I'm missing something. A borderless fullscreen mode would be nice. Or at least a way to hide all borders/interface. Then it should be simply enough to use a third party tool to achieve it. The reason why it would good is simply that borderless is a good alternative to using vsync, if you like it more. There's different trades offs to them. I haven't come across an NES emulator that can play the title 'Little Nemo - The Dream Master' to my complete satisfaction. One reason is that the game requires chopping in most sides of the screen. A couple of emulators that do this. And puNES provides the tools for this, great. However, the game also has an annoying flickering glitch line between the game world and the game's interface. When the emulation is running this line is a real eye catcher because it contracts/expands continually. I like for a way to hide it. 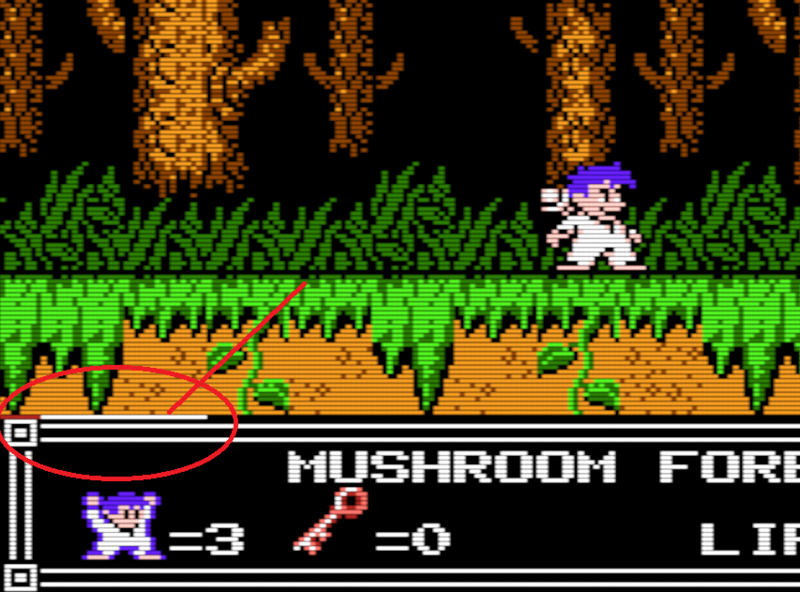 The only NES emulator that I know of that fixes this glitch is JNES. However, that particular emulator only has left side 8px chopping. So here's an opportunity to beat all of the others in this particular case. I see that same glitch using an authentic Super Mario Bros. 3 Game Pak in my front-loading NES. I imagine several other early MMC3 games had similar glitches. Does your Little Nemo Game Pak produce that glitch on your NES? I have an EU NES with a bunch of games, though, some of my games is currently lost in storage. Or even lost completely. This includes my original copy of Little Nemo. So I can't test it out, unfortunately. But original glitch or not, it is a strength of emulation to able to fix such things. It could just be an optionally fix. In case you really like such glitches for an authentic look. I don't think it goes against the principals of puNES since it also has options of such as 'no spites limits'. Some devs would not include such options because of the possibility of mistaken bug reports. Though, I think that's too bad, even if I can relate to the issue. Game specific glitches should be fixed in the game's ROM image, not in the emulator, I would say. Perhaps. But at least one emulator already fixes it that I know of, so some will disagree to that. The point is, if this glitch happens in multiple games then it's not really an isolated case. So it might make sense to make a general fix for it. Now I admittedly don't have the information to extrapolate what make sense to do. Other than 'tepples' said that he has seen the same glitch in another NES game. But still, a patched ROM would fix my own personal wanting. So it could a solution, certainly. So I've gone ahead and also made a request on 'romhacking.net'. That seems to be the place ask for such, at least. Probably not knowingly so. More likely the emulator is just inaccurate in some way so that it ends up not showing that glitch by coincidence. Glitches like this can only be fixed on a game-by-game basis because they are caused by the game software. (Unlike, e.g., the 8 sprites per scanline hardware limitation which can be improved by emulators.) So there are basically two options: (1) fix the ROM, or (2) have game specific patches in an emulator. There's no easy "generic" solution. I figure option (2) would be easier (the emulator could do things like paint on top of the emulated image without considering NES limitations), although it would still likely have to track the state of the game (e.g., by observing RAM values). Okay, I could imagine that you could well be right about that all of that. It would also be interesting to hear what the puNES author(s?) thinks of it. Maybe I'm lucky enough that he'll chime in with his perspective on it later. I haven't had any luck finding a person who could fix the mentioned issue in the rom. However, I wanted to say that I've fixed the issue by simply drawing an image on top of puNES with a black, borderless frame fitted to the purpose. It seems I then might have been wrong about my initial impression of puNES using exclusive fullscreen, because I don't think it'd been possible if that was actually true. But now that this isn't strictly related to the topic of this emulator anymore, I probably shouldn't go into too much details here. Hi, author to the Bliss-Box here. A few things to know; One we are in the process of developing a light gun adapter. This product will adapt light from the plasma/lcd/projection TV's to CRT light. This product will just snap on the front of the gun. A prototype is ready, just securing funding and the patent. two) The current Bliss-Box will sense two things, 1) the light from a CRT screen (button 2) and the trigger (button 1). If you watch for the signal (square flash) from the game and wait up to 16 ms for the button 2 to trigger, it will in theory work. AFAIK the algorithm is much longer with consecutive lashes. Though it all comes down to one very simple thing. Did the gun see light? The adapter simply passes the info to buttons. The only problem is the poll rate for usb on this adapter is 16ms. Fortunately that is the length of a video frame. Unfortunately it's enough to miss a hit. Though this can be adjusted in the emulator. Just wait an total of 16ms + items on the screen + 16ms. Not like anyone can fire off two rounds in 32 ms anyways Then time the hit based on the flash of the square. If both buttons are pressed (1 and 2) something was hit. If you need to contact me use the email I registered with.